Trust me – dancing isn’t just a skill to get you in the family way. A few good hip-shaking moves might also get you through labour, and through a year or two with an infant, too. Just look at any new parent. Even without the kid in their arms, you can identify them by that semi-catatonic rocking back and forth thing that they can’t stop doing. I’ve recently read that dancing makes you happier. The endorphin boost from the exercise, the social interaction, and the required concentration lift your spirits. Dancing stimulates the hippocampus (the part of the brain that helps regulate mood and stores memories), sparks new nerve growth, and, according to one German study, lowers levels of stress hormones. So why not get together and rock your belly, or baby, for a little free dance party? 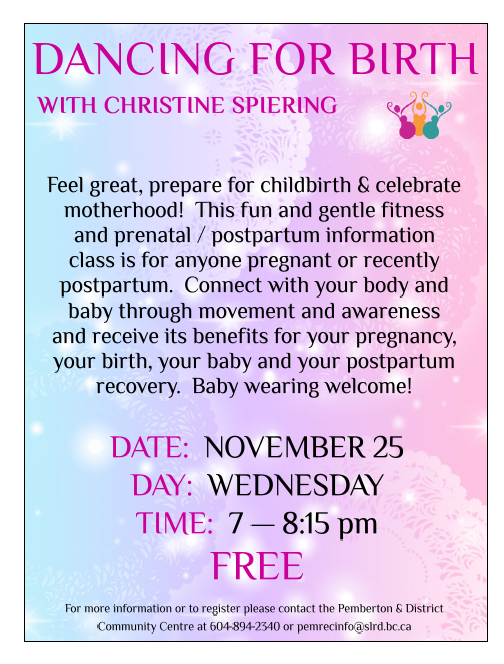 The Pemberton & District Community Centre is offering a free class for expecting and new mamas, on Wednesday, November 25, with local doula Christine Spiering.